(Los Angeles, CA) – The Los Angeles City Council today unanimously voted to approve a 30-year $4.9B contract with LAX Integrated Express Solutions (LINXS) to design, build, finance, operate and maintain the Automated People Mover (APM) train system at Los Angeles International Airport (LAX). Today’s approval marks the largest contract ever awarded in the City’s history. The item was heard at Los Angeles City Council’s Trade, Travel and Tourism (TTT) committee meeting on April 10, where it was alsounanimously approved. "The Landside Access Modernization Program is a perfect example of how we can make LAX a world-class airport and a first-class neighbor at the same time," said Councilmember Mike Bonin. "Every person who boards a train to the airport represents a car that will not need to be on local roads, contributing to traffic in neighborhoods near LAX and adding more pollution to our air. By making getting to and from LAX more convenient and stress-free for travelers with a connected and efficient transportation system, we are making life better for the people who live in the Westchester and Playa del Rey neighborhoods near the airport. 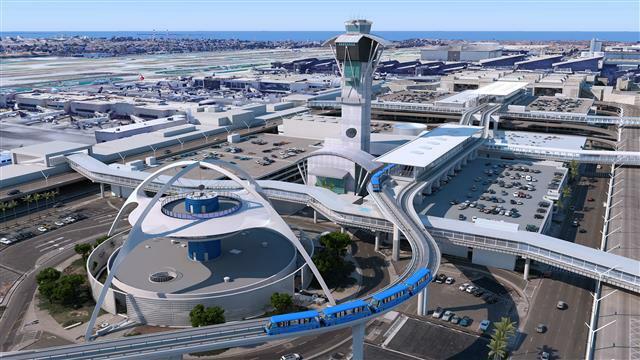 I am excited and encouraged by today's vote and I congratulate LAWA on making progress toward finally connecting the region's largest airport with more public transportation options." Convenience, reliability and easy accessibility are key elements of the user experience and are integral requirements for the APM. Trains will arrive every two minutes, have wide doors for easy access with luggage, large windows for viewing, plenty of hand holds and seats for those in need. Station platforms are open air, light-filled and have escalators, elevators, and moving walkways for quick, convenient access to the terminals. Architectural features include a viewing platform of the iconic Theme Building, an Experience LA center with an 800 sq./ft. LED programmable screen and an LED light band that accents the 2.25 mile guideway. LAWA anticipates that the APM will offer a maximum ridership capacity of 10,000 passengers per hour and up to 87.7 million passengers per year. The system will be operational in 2023. The APM is the centerpiece of the Landside Access Modernization Program (LAMP), which also includes a Consolidated Rent-a-Car (ConRAC) facility, Intermodal Transportation Facility-West, and associated roadway improvements. The APM will reduce vehicle congestion in the terminal loop, provide a connection with L.A. Metro's regional transportation system, create new and convenient locations for passenger pick-up and drop-off outside of the terminal loop, reduce emissions, and provide reliable access to the terminals. For additional images and more information,visit FlyLAX.com/ConnectingLAX.